There are two types of gaming laptop in this world. Those with gorgeous, so-good-I-want-to-lick-them OLED screens and those without. 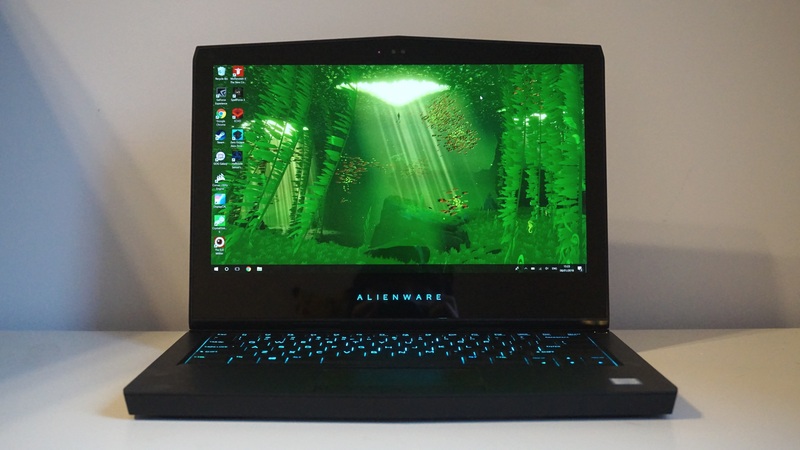 Happily, Dell’s Alienware 13 is one of the former, and by god is it beautiful. If the paltry, washed-out screen on Dell’s Inspiron 15 7000 Gaming laptop was like a banged up Ford Fiesta from the mid 90s, the Alienware 13 is a modern day super car, its OLED panel and oozing luxury from each and every pixel. OLED screens aren’t new, of course. Mobile phones and TVs have been using them for years, but it’s rare to see one on a laptop. Indeed, going back to a regular LED screen now, even one as finely calibrated as my own AOC Q2770PQU monitor, just makes everything seem drab, dreary and dull by comparison. So what makes OLED so special? Unlike a normal LED screen, it doesn’t require a backlight to be spread across the entire screen. Instead, each pixel is self-emissive, capable of creating its own light when needed. This means that when an image wants to display black, the relevant pixels can just switch themselves off, creating proper black instead of the varying whishy-washy shades of grey you normally find on an LED screen, like TN, IPS and VA monitors. With a greater range of blacks at its disposal, this also means OLED screens have an infinitely superior contrast ratio, as they’re naturally capable of producing more detail and levels of shadow gradient than their LED counterparts. OLED displays also look fantastic no matter what angle you’re viewing them from (colours will still look good even when the screen’s tilted as far back as the picture above), and their colour accuracy is proper god-tier kind of stuff, making everything look richer, punchier and more vibrant across the board. Indeed, the Alienware 13 hit 100% of the standard sRGB colour gamut when I tested it with my i1 Display Pro calibrator, and it even covered 100% of the wider, professional-grade DCI P3 gamut as well (the one Apple keeps banging on about with its latest iPhones), beating the almost-as-lovely-looking-but-twice-as-expensive MSI GT75VR by a fair clip. This is about as good as screens get in this day and age, and the fact it also has a 2560×1440 resolution is just the icing on this already fine cake of a display. Is it worth the money, though? That is the question indeed. For as lovely as the screen is, I sort of wish its resolution wasn’t quite so high, as the most powerful graphics chip on offer here is Nvidia’s GeForce GTX 1060, which is arguably better suited to maxed out 1080p gaming than it is 1440p. You can also opt for a GTX 1050 or GTX 1050Ti on lesser models, but they’re even less well equipped to deal with 1440p than the GTX 1060. Take The Witcher III, for instance. At 2560×1440, I had to settle for the Medium preset to get a smooth 45-50fps average, but dropping the resolution to 1920×1080 allowed me to bump up it to High and get an even more stable 55-60fps in the process. I saw the same thing in Assassin’s Creed Origins and Middle-earth: Shadow of War as well, where Medium seemed to be the best compromise between frame rate and graphical fidelity at 1440p, while High (or even Ultra in Shadow of War’s case) at 1080p yielded results that rarely dropped below 50fps. Total War: Warhammer II proved a tough test for the Alienware 13’s GTX 1060 as well. On High at 1440p, zooming in to within an inch of a Lizardman’s battle axe saw the frame rate slow to around 30fps in combat, while Medium saw results of around 40fps. This was good enough for the most part, but once again High at 1080p proved to be the best balance between resolution and fine detail, producing an average frame rate of around 53fps in battle and only dropping to 50fps when watching units duke it out up close. This won’t be the case for all games, of course. Wolfenstein II: The New Colossus and Doom, for instance, ran much better at 1440p, with Doom comfortably hitting the full 60fps with everything maxed out. Wolfenstein II needed a little more tweaking, as its top Mien Leben setting tended to settle around the 40-45fps mark, but dropping one rung down to Uber quickly saw the frame rate counter shoot back up to a silky 60 frames. Rise of the Tomb Raider, meanwhile, was also a bit demanding on its top graphics setting (Very High), but regular old High at 1440p still produced a respectable average of 48fps across its three built-in benchmarks, which cover the snowy mountain peak from the start of the game, a scene inside the early-on Syrian ruins and the last act’s notoriously power-hungry geothermal valley. Admittedly, all three dropped to lows of around 26fps on occasion, but I saw the same thing happen again when I tested it on Medium, suggesting you’re unlikely to escape the odd hiccup no matter what setting you end up using. Clearly, though, there are plenty of compromises you’ll need to make if 60fps at 2560×1440 is your top priority here, and it makes me wonder why Dell a) chose this resolution in the first place, and b) why there isn’t another graphics chip option available that could make full use of it. It feels like a bit of a punch to the gut considering how much it costs (the most I tested costs £1849 in the UK and $2229 in the US), and hamstrings an otherwise highly desirable laptop. 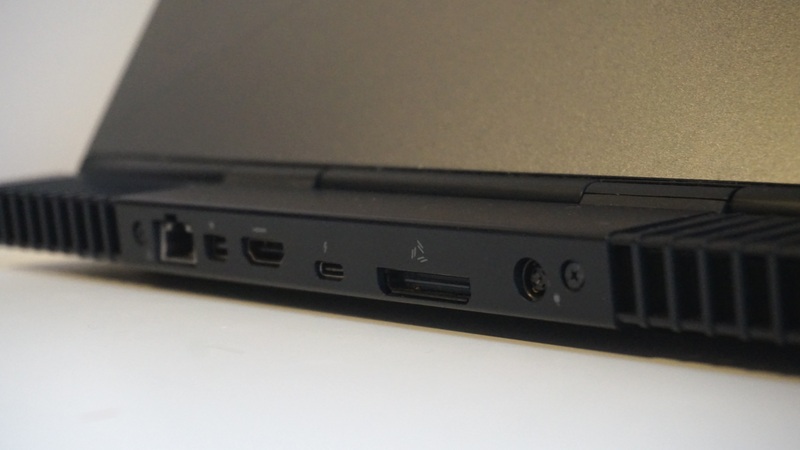 To be fair, you could always use the Thunderbolt 3 or Alienware graphics amplifier ports on the back of the laptop (see above) to upgrade it in the future (for the latter you’ll need to buy the titular £160 docking station separately), but I’d argue that a laptop’s graphics card should be tailored to fit the screen it to comes with. It wouldn’t be so bad if there was a 1920×1080 OLED option, but alas, the only Full HD screen available on the Alienware 13 is an IPS panel – which, judging by the state of Dell’s Inspiron 15 7000 Gaming’s IPS display, almost certainly isn’t worth the downgrade. If I ever get one of the other models in for testing, I’ll let you know, but what I can tell you is that you should avoid the entry-level 1366×768 model at all costs – that’s a complete waste of space if ever I saw one and a huge disservice to both the GTX 1050 or GTX 1050Ti chip it comes with. It all makes the Alienware 13 is a slightly frustrating piece of machinery, as the rest of it provides almost everything you could possibly want from a high-end laptop. The model I tested had a quad-core 2.8GHz Intel Core i7-7700HQ processor and 16GB of RAM, giving it plenty of heft outside of gaming (it scored 3566 and 11,440 respectively in Geekbench 4’s single and multicore tests), and its backlit keyboard was a pleasure to type on. Yes, the single 256GB SSD option doesn’t provide a great deal of storage, but at least there’s the option to add a 1TB HDD to the mix (or simply get a higher capacity SSD) when you come to buy it through Dell’s website. One minor annoyance is that the Alienware 13 only has two regular USB3 ports, as the other two are USB-C (including the aforementioned Thunderbolt 3 port). This means anyone with a mouse and a USB headset might find themselves a bit short if you also want to attach a USB drive or external HDD, so investing in a USB hub might be wise. Elsewhere, you get separate headphone and microphone jacks, an HDMI 2.0 output, a mini DisplayPort output and Gigabit Ethernet. 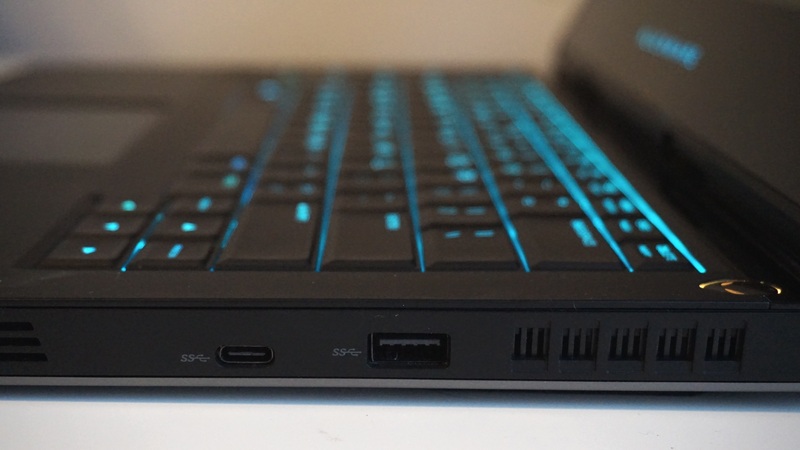 The Alienware 13 also comes with a Tobii Eye Tracker built into the top of the display. This futuristic doodad is quite a clever little thing depending on how you look at it, as it can automatically dim or turn the screen off when you move away, helping you save power, or even going into sleep mode without you having to press a single button. Alternatively, you might find it’s the most annoying thing ever, as I discovered when attempting to benchmark Hitman and it immediately paused the game because I wasn’t sitting directly in front of it the entire time. Support in other games varies, but Assassin’s Creed Origins is probably one of the most comprehensive examples available, including the ability to control the camera WITH YOUR VERY OWN EYEBALLS. The problem with that, of course, is that there are so many nice things to look at in AC Oranges that you run the risk of turning the camera into a schizophrenic nightmare beast that flits from one rustic market rug to the next in dizzying succession. FPS fans will probably get more out of it, though, as the number of times I’ve spotted enemies only to get insta-killed because my mouse hand’s too slow is too great to even think about. I just wish the tracker’s flickering red light wasn’t quite so distracting, as I found this more irritating than the giant, illuminated ALIENWARE logo embedded into the screen’s over-sized lower bezel. Still, you can always turn the tracker off if it gets too distracting. Despite its flaws, I think I’d still recommend the OLED version of the Alienware 13 (available direct from Dell UK and Dell US), if only because the screen is just so damn beautiful. Yes, it would be nice to have a graphics chip that really makes the most of its 2560×1440 resolution, but when neither of its larger, more powerful siblings, the Alienware 15 or Alienware 17, fill that gap either, I’d rather have a lovely OLED screen than get a potentially disastrous Full HD display in a bid to save money. Another point in the Alienware 13’s favour is its size. For me, a 13.3in laptop is just right for taking on the move, and while its sci-fi, blatantly-stolen-from-Area 51-style chassis may not be to everyone’s tastes, it certainly looks a heck of a lot less embarrassing than other laptops of its ilk. Its weight of 2.6kg (or 5.8lbs) didn’t feel like a ton of bricks when I took it home over Christmas either, which is always a plus. More than anything, though, opening up that lid never fails to make me smile. Games just look absolutely stunning on it and it’s a real feel-good bit of kit – something I wouldn’t trade for all the anti-aliasing options in the world. It might be a bit flawed, but I’d be lying through my teeth if I said I didn’t want one for myself. Tagged with Alienware, Dell, feature, Hardware, laptop, laptops. Katharine writes about all the bits that go inside your PC so you can carry on playing all those lovely games we like talking about so much. Very partial to JRPGs and the fetching of quests.